The simple fact of our dystopian reality is that unless we do something unprecedented in human history and pivot the global economy away from fossil fuels in the next 12 years, we will experience runaway ecological collapse in 20 years. In other words: the only planet mankind has ever known will become incredibly hostile to life. Given that the Republican Party is comprised entirely of either climate deniers or people who profit off of climate denial, they cannot be expected to step up and do what is necessary to stave off the apocalypse, and so it’s also a simple fact that unless the next Democratic president aggressively steps up to counter this generational challenge, we are completely screwed. Now, supporting the “idea” of a Green New Deal is not indicative of your standard Democratic BS of saying they endorse progressive ideas in general, but refusing to actually get into specifics once it comes time to put up or shut up. The Green New Deal is simply not a specific policy proposal yet. Progressives have put together a platform that is serving as the framework for it, but unlike Medicare for All, there is no comprehensive bill put forth yet. 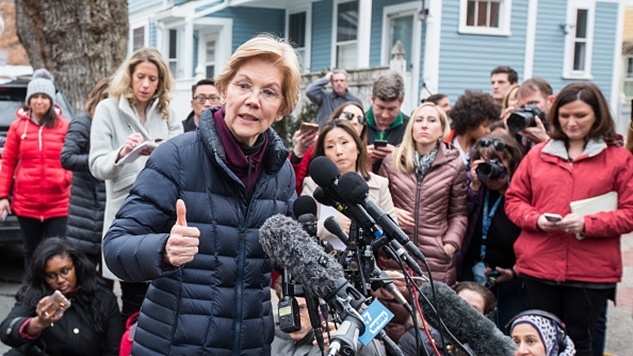 Whatever the nitty gritty details of the Green New Deal, the overall goal of decarbonizing the economy is the big picture goal, and that seems to be what Warren is endorsing. She joins New Jersey Senator Cory Booker, Washington Governor Jay Inslee, and Democratic mega-donor Tom Steyer as presidential candidates who have voiced their support for this broad proposal to save the world. Whether this is simply pandering to the left or a serious assessment of our hellish reality is to be determined, but the significance of 1st tier 2020 contenders (and Tom Steyer) endorsing the most ambitious policy proposal of millennials’ lifetimes should not be dismissed. Hillary won the battle in 2016, but after one glance at everyone’s emerging (progressive) presidential platforms in 2020, it’s clear that Bernie won the war. He too endorses the conceptual model of the Green New Deal, and it seems increasingly likely that the major separation in the Democratic Party will take place around this policy. Medicare for All is frankly, a political no-brainer given that 51% of Republicans support it, and it seems as if the entire Democratic Party will be running on that policy. The Green New Deal is less specific right now, which makes it harder to pin folks down on their actual support for it, but it is just as pressing and necessary a policy to enact as pivoting away from our atrocious private health care system. For all the talk on Twitter about the replay of the 2016 primary taking place around Beto O’Rourke, zooming out on the Democratic field sure looks like we are going to have a battle of big ideas in 2020. It’s a bright new day on the left, and while there is plenty to be cynical about in politics these days, the rapid growth of the Green New Deal’s popularity is an unimpeachably positive development.